Carrie Grace Henderson, a reporter with (Waterbury) Republican-American has written an article on the Freunds of Canaan, Conn. who are building a new dairy barn and adding Lely A4 Astronaut robotic milking system. Read the excerpt below or the entire article here. The cows on Freund’s Farm are about to trade in their cowbells for transponders, and robots will take over their daily milking. The Northwest Corner farm next year will become the first in Connecticut to include robotic milkers in a new, high-tech barn _ a move that the Freund family says will save manpower and could increase milk production. It’s a bold move for the family business, one of the last 149 dairy farms in Connecticut in a state once home to hundreds more. The family decided in January to build a new barn and include the latest technology, said Isaac Freund. They hope construction will be completed by next spring. Isaac Freund and his sisters, Amanda and Rachel, are third-generation Freund farmers. Their grandfather bought the land in the late 1940s. While Freund’s Farm will be the first in the state to switch to robotic technology, the trend is growing in New York, Massachusetts and New Hampshire, said Wayne Kasacek, Department of Agriculture assistant director. The milking of cows is a chore long ago mechanized but people were still required to hook the cows up to the equipment and groups of cows had to be milked at once. At Freund’s, which has a herd of 300, the cows currently are milked twice a day, at 12:30 p.m. and at midnight. The milking stalls can hold 20 cows at a time, while 50 to 60 others wait in a holding area that can be hot and stressful to the animals, Rachel Freund said. The robots will turn the farm into a 24-hour milking operation. The new system will recognize each cow as it comes through the barn door with chips inside a transponder around its neck, Rachel Freund said. The robot, which looks like any stationary stall, has a laser that will take 3D images of each cow’s udder. This allows the robot to attach itself without human intervention. When it recognizes each cow, it will know how to attach itself for milking. The cows will be trained to seek out the robot at milking time. The freedom of each cow to make its own schedule will allow for more than two milks a day for fresh cows and fewer for cows that produce less milk, Rachel Freund said. The cows will have to get used to the robots, and each animal will have to be walked through the machine one at a time during the first week. Cows will be enticed into the robot with grain. After initial training, when a cow decides it is milking time, there will be a handful of cows ahead in line, rather than the 50 to 60 in the holding area. 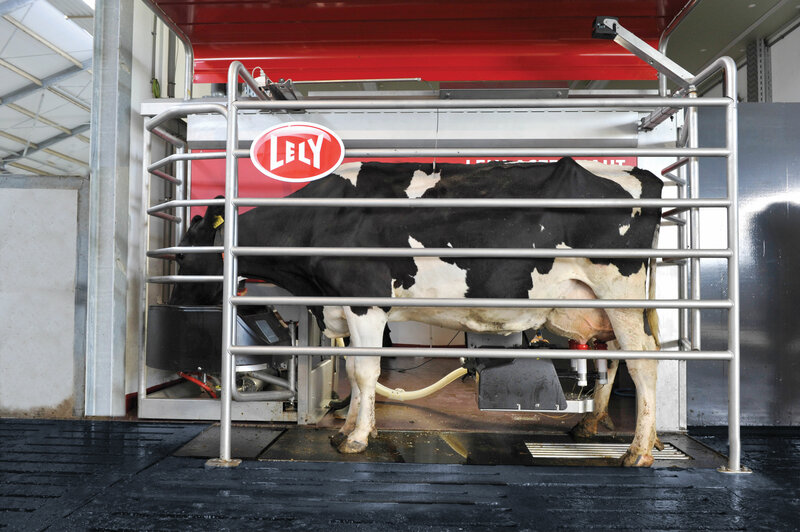 Freund’s chose a Lely-brand robot from Europe. The most recent model, the Astronaut A4, costs upward of $200,000. The high-tech collars will provide other helpful information as well, such as how many times a cow ruminates _ or chews her cud before digesting it _ as well as how much the cow walks around and when it may be in heat. The new barn will have other updates including insulation, new bedding and alley scrapers that clean barn floors without disturbing resting cows, all in the hope of producing more milk. Rachel Freund said the new technology can cut the cost of labor, but with a sprawling operation that includes more than 600 acres of crops, it is unlikely the farm will have to cut staff. A study by the Penn State College of Agricultural Sciences said robot milking can increase production between 3 percent and 11 percent. “If a cow is comfortable, she is producing milk,” Rachel Freund said.